← Les Blank, Always For Pleasure. Part Four. Les Blank: Always For Pleasure. Final Thoughts. 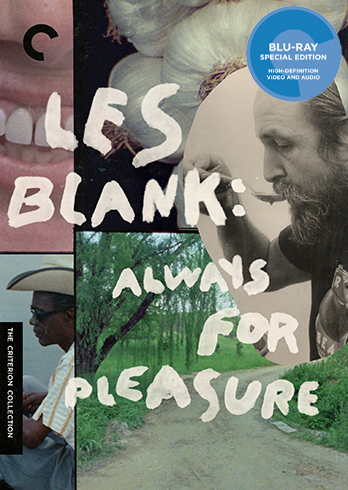 Over the last month or so, I have tackled the terrific Criterion box set, Les Blank: Always for Pleasure. It consists of fourteen main features, countless supplements, and various other short films. It is a treasure of riches, as Blank takes us through Cajun country, up to Northern California, across the country to the Blue Ridge Mountains, up north to New England, back to California, Louisiana, and ending with a spiritual celebration in New York City. In the process we experience various different cultures, foods, music, and vibrant characters that are so far fetched that they cannot be made up. Les Blank’s world is about as far from the mainstream as possible, but it is about living life to the fullest, enjoying the simple things, and respecting traditions. As a recap, I’ll look at the different types of topics that Les Blank explored, and how his vision was unique compared to so many others. Today it seems like most musicians and bands with a fan base have their own documentary. They are relatively easy to put together thanks to DIY independent film avenues and crowdfunding like Kickstarter. The larger the band, the larger the production, and the sales are nearly guaranteed. Most of these documentaries fall into one of two categories: the career narrative and the concert film. While some can be extremely good, such as somewhat recent documentaries on Rush, Metallica and Big Star, but they follow the same formula. They talk about the band’s origins, their success, breakup, and aftermath. They show concert footage and talking head interviews with anyone and everyone they can find. Many of these are inspired by VH1’s Behind the Music more than filmmakers like Les Blank or D.A. Pennebaker, and that’s a shame. 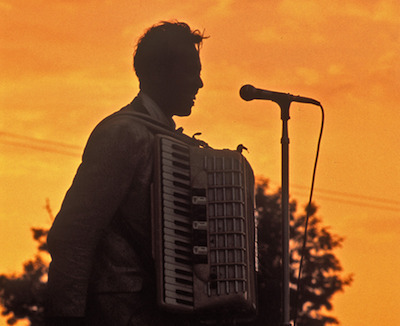 In many ways, Les Blank was a pioneer of the music documentary, and in other ways he was completely isolated from the genre, on his own island. He started with Dizzy Gillespie (which is not on the disc), and from there, he found some blues artists in Texas and Louisiana. He ventured further away from the Deep South, and covered artists that would not be found at the top of a music chart or featured on MTV. He wasn’t interested in only the musician, but also the way that they lived, the place and culture that molded them, and, perhaps most importantly, the affect they had on others. The one common thread among all of his musical documentaries is people could dance to the music. The people who experienced and enjoyed the music were just as essential to the documentary as the musician and the music. Les Blank’s music work predated MTV, VH1, and Kickstarter, although it eventually caught up and he worked concurrently with the transformation of audio to video. He undoubtedly saw the musical documentaries from Pennebaker, Scorsese, Demme, and others, and you would think those would influence his style. Nope. From the first documentary on the disc, The Blues According to Lightnin’ Hopkins in 1968 to the final documentary, Sworn to the Drum, very little had changed. He had as much interest in how and where Hopkins grew up as he did Francisco Aguabella. He could not travel to Cuba to understand Aguabella, but if it were politically possible, he unquestionably would have. It is no coincidence that both of these documentaries are just about a half an hour long, feature the artist’s music as the soundtrack, show people dancing to the music, and explores the roots and ideologies that make them express themselves through sound. 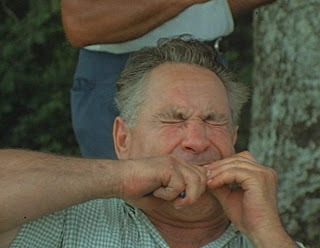 Again, Les Blank was a pioneer when it came to documentaries about food. Unlike with music documentaries, food via the mass media found a home almost exclusively on television. Blank probably had more influence than he gets credit for, since it was the Cajun cuisine that became a large part of cooking television. One of his subjects, Paul Prudhomme, even had his own short-lived series on Public TV during the nineties. Other personalities like Emeril Lagasse and Justin Wilson also became Cajun celebrity chefs. As Blank demonstrated, Cajun cuisine is delectable, and until the 1990s, was virtually unexplored as a mass consumer cuisine. 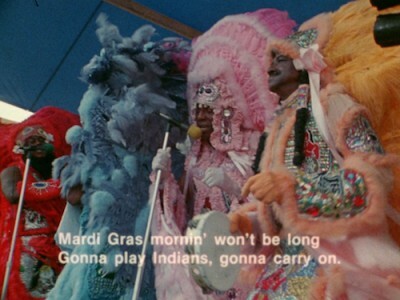 Today you can get Cajun food everywhere, but not the type of food that Les Blank’s subjects cooked. 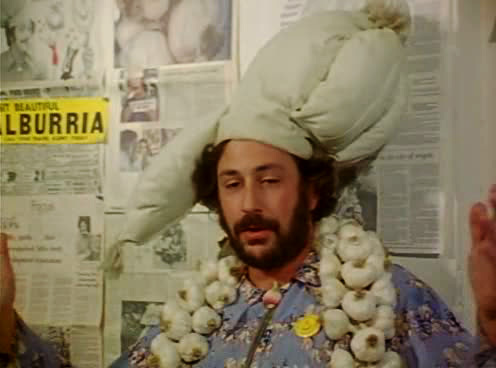 Food was such a central subject with his documentaries, that it comes as a surprise that only two of the films on the disc were specifically about cuisine. He explored garlic with Garlic Is as Good as Ten Mothers and Cajun in Yum, Yum, Yum! A Taste of Cajun and Creole Cooking. Despite it not being the sole subject, food is a large part of most of his documentaries. For musicians, he wants to know what they eat in addition to where they live. When he looks at cultures like Cajun or Polish-American, he spends a lot of time with their foods of choice. Even with Tommy Jarrell in Sprout Wings and Fly, he has a scene at the dinner table where they serve traditional southern food. Even though each documentary had a subject, Les Blank’s films were just about the way people lived. Whether they were laborers in the middle of Texas, hippies in California, or country folk living in the mountains, we got to see what they did, how they behaved, and we heard their thoughts and ideas on life. As I reflect on this boxset, I think back to the early documentaries where he shows gorgeous landscapes, stunning sunsets, or just people wandering to and fro. People fascinated Blank, and that fascination was not restricted to his subject. He was enthralled by people running in a field just as much as he was a crazy actor arguing with a director (from Burden of Dreams about Herzog and Kinski, which was not on the set), or an old musician talking about playing baseball in the fields as a kid. Food and music were just two examples of the many outlets people found to enjoy life. The Maestro dedicated his life to painting hundreds or perhaps thousands of pieces, not for economic benefit, but for his own passion. Blank loved to show people that were proud of something, whether it was a distinctive physical imperfection like a gap between two front teeth, or people who tried to compete with each other by wearing the best costumes at Mardi Gras. He showed people having a good time however they could. It doesn’t matter whether people were poor and lived in small Texan towns, or if they were doctors and lawyers that wanted to dance polka for a week, there was a smile on their face. If a nagging tooth gets in the way, then just pull it out and enjoy life. Thanks Les Blank for showing us your world. Posted on February 20, 2015, in Criterions, Film and tagged always for pleasure, boxset, criterion, film, les blank. Bookmark the permalink. 4 Comments. Thank you! He was quite prolific. What’s amazing is this set encompasses about half of his work. You can see a lot of them on Hulu+ even if you do not buy the set.